Three teams, involving 15 researchers from UTAR Faculty of Medicine and Health Sciences (FMHS), Lee Kong Chian Faculty of Engineering and Science (LKC FES), Royal Bird’s Nest Sdn Bhd, University of Manchester and Forest Research Institute Malaysia (FRIM) won two gold and one silver medal at the 29th International Invention & Innovation Exhibition (ITEX) 2018. The event was held at the Kuala Lumpur Convention Centre (KLCC) from 10 to 12 May 2018. It was organised by Malaysian Invention and Design Society (MINDS). 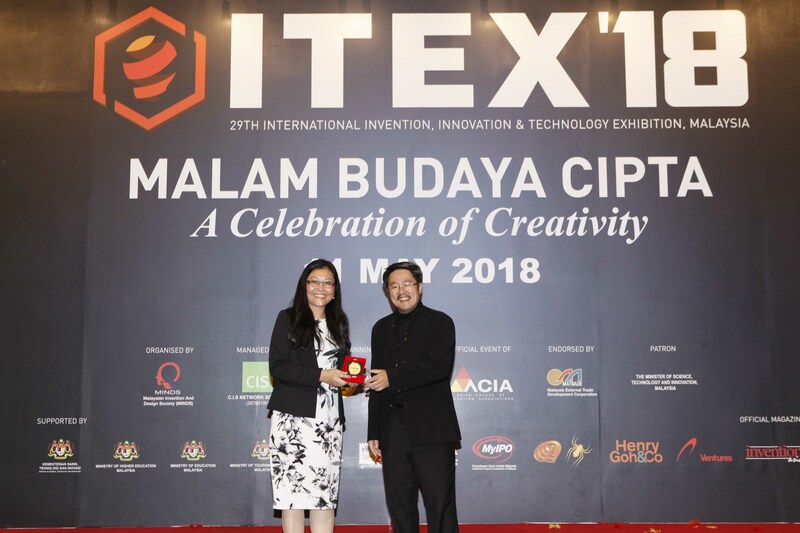 ITEX aimed to attract investors, venture capitalist, manufacturers, entrepreneurs, distributors and corporate sectors to explore new business ventures as well as to allow fellow inventors and researchers to discuss and debate their research works. It also aimed to provide a platform to commercialise new products and inventions and provide the best audience for the prototype inventions. The three-day exhibition showcased the region’s best inventions from Asia and Europe. It also saw participation from more than 20 countries. The exhibition was one of the largest invention exhibitions in the world and it featured 23 invention categories related to innovation and technology. The first winning team was comprised of FMHS Centre for Cancer Research Chairperson Prof Dr Lim Yang Mooi, FMHS Dean Emeritus Prof Dr Cheong Soon Keng, University of Manchester ResLife Advisor Ho Yu Siong and Royal Bird’s Nest Sdn Bhd Group Executive Director and Chief Executive Officer Dato’ Tan Chee Hong. The team won a gold medal for their invention called “Acid-extracted EBN extract”. Their invention involved the development of an acid extraction method with a customised heating device to extract edible bird’s next extract that has the capability to regenerate the degenerated neuronal cells. FRIM and UTAR won a gold medal for their invention called MYWOOD-ID, also known as mobile wood identification system. The winning team was comprised of UTAR LKC FES Centre for Computing and Intelligent Systems Chairperson Assoc Prof Dr Tay Yong Haur and Master of Engineering Science student Tang Xin Jie, FRIM Forest Products Division Director Dr Gan Kee Seng, Forest Products Division Wood Quality & Engineering Programme Head Dr Mohamad Omar Mohamad Khaidzir, Forest Products Division Processing Programme Head Dr Mohd Tamizi Mustafa, Forest Products Division Wood Anatomy Laboratory Head Dr Nordahlia Abdullah Siam, Forest Products Division Lim Seng Choon and Information Technology Branch Officer Omarali Abdul Rahim. Meanwhile, LKC FES Centre for Power Systems and Electricity Chairperson Prof Ir Dr Lim Yun Seng, LKC FES Dr Wong Jianhui and LKC FES Master student Ace Khaw Lin Yi won a silver medal for their invention called the “Intelligent Energy Storage System”. The invention, developed and installed on the power grids, aimed to reduce peak demands for utility companies, to reduce maximum demand charges for customers and to solve power quality issues. “We are indeed very glad to have won the silver medal for our invention. We thank UTAR and MOSTI Science Fund for the support in the design, development and patent filing of this invention. We are looking forward to commercialise our invention in the next phase,” said the winners of the silver medal.